Spence’s 1910 plan for the building, superimposed onto the site in May 2012. The charming anecdote of ‘The Tin Tabernacle’ being transported across St. Andrews in sections is a favorite amongst long-term citizens of the town. Yet while the history of fixed site cinema exhibition in St. Andrews started with a bang, or rather the chug of a steam traction engine, the demise of this venue is less fondly recalled. After almost a century of transformations, which left the former church almost unrecognisable, ‘The Tin Tabernacle’ was demolished to make way for flats in 2003. John ‘Jock’ D. Spence’s original plans for the move, approved in September 1909, show that the building was positioned between St. Andrews Electric Corp. (to the south), a slaughter house (north) and a row of residential buildings (east). While this might appear an unusual place for an all-round entertainment venue, it may be indicative of the lower social status of the cinema in this period as the building was moved from a prominent position within the old town (on The Scores) to its new resting place on the outskirts of town. In March 1910 Spence submitted plans to extend the building he now dubbed ‘Assembly Hall at Bassaguard’. 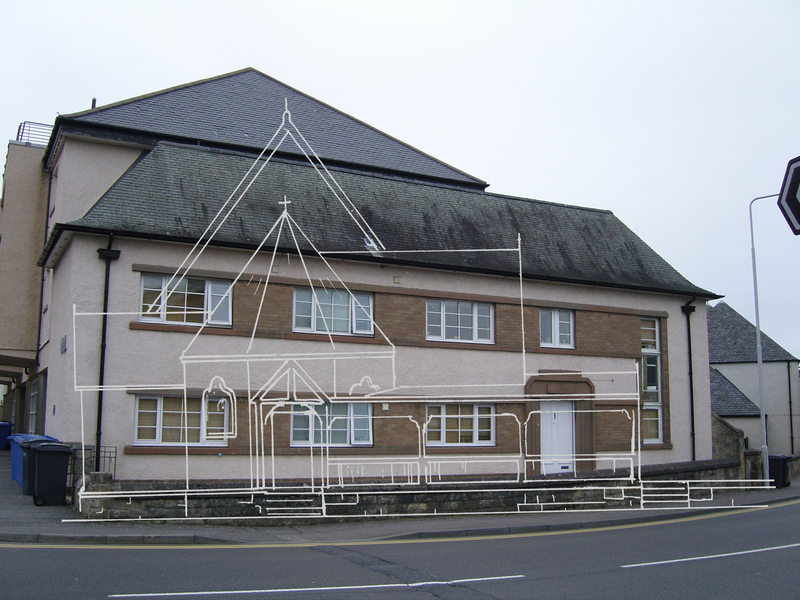 The plans retained many of the former church’s original features, most notably the pointed arch windows with metal terraces, the 41 ft. tower and the arch brace roof (shown in the ‘cross section’). However, the modifications also reveal the new intended uses for the site. Spence significantly extended the building over a nearby ditch, which allowed for a hall of 86 ft. in length and 38 ft. wide (3,268 square ft.). This provided enough space to seat 600 people comfortably. 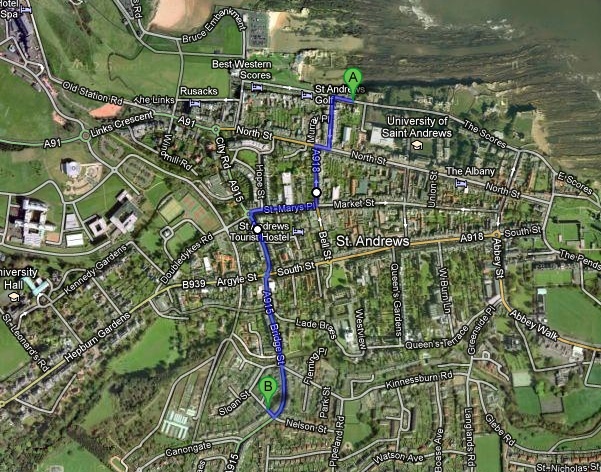 The most drastic change outlined in the plans saw the addition of an entrance area facing onto Largo Road. This entrance area now included adjourning ladies and gents cloakrooms, with ‘lavs’ to the right and an office to the left. As well as the steps leading directly to the doors, a 27 ft. long elevated shelter was added along the front of the structure to allow queuing patrons to shelter from the elements. Photographs of the building prior to its demolition indicate that the remaining windows had been shuttered. This was essential in order to keep out light during film screenings. 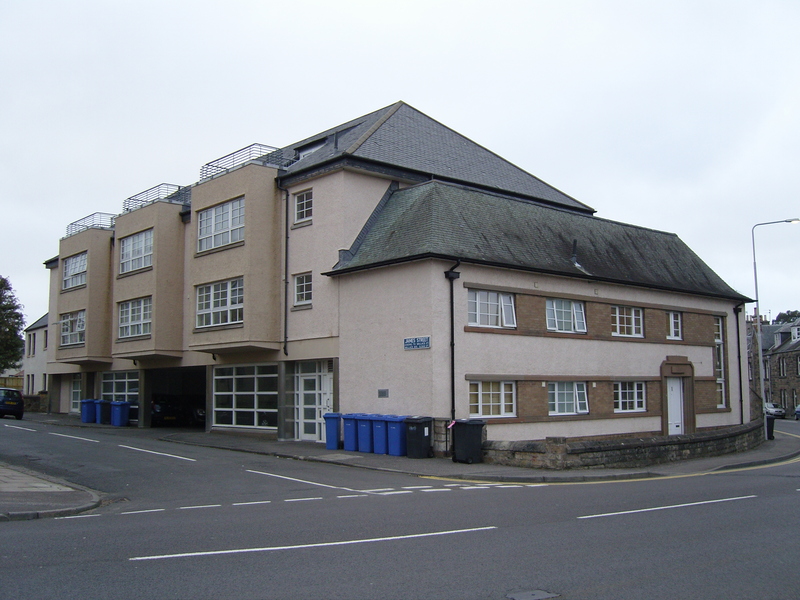 In spite of the demolition, some evidence of the original building still exists on the corner of James Street and Largo Road today. Firstly, the pavement remains lowered at the point where Spence’s 1910 entrance would have met the road. In addition, the original wall is lighter in colour where the steps up to the queuing area were later filled in. 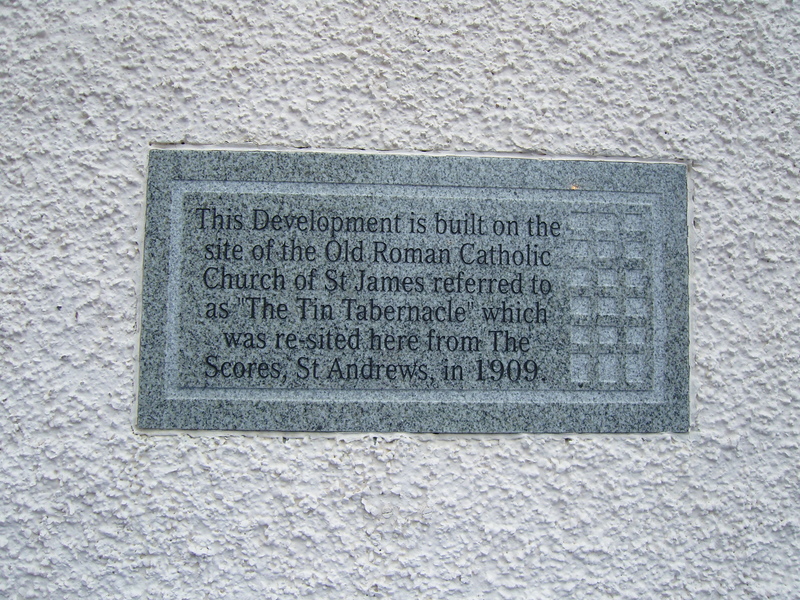 Most notably a plaque placed on the south side of the development tells the familiar story of ‘The Tin Tabernacle’s’ move across St. Andrews. Once again, it is this move that is memorialised here as, through this plaque, ‘The Tin Tabernacle’ continues to entertain the town, no longer through its film shows, but rather through the oft-repeated story of its journey more than a century earlier. Dean of the Guilds Records, MS DEP-103/1 and MS DEP-103/2, University of St. Andrews Special Collections, St. Andrews. ‘Site Record for St. James Roman Catholic Church’, Canmore online database.